"This is a wakeup call. 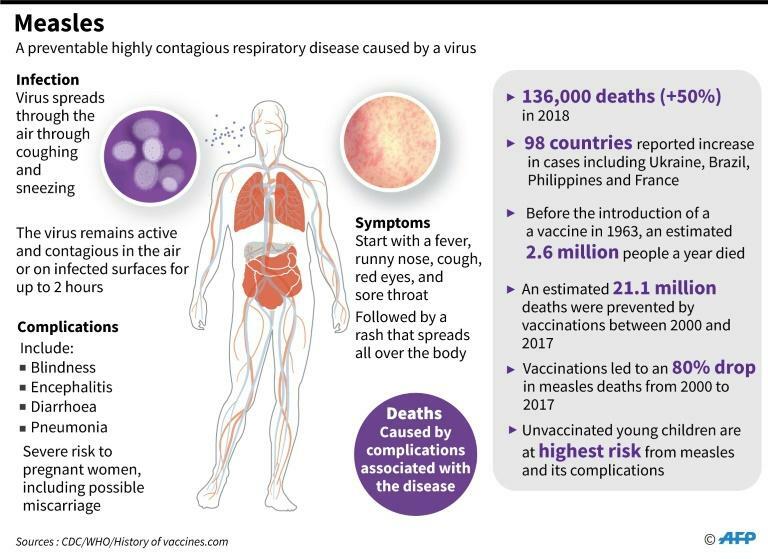 We have a safe, effective and inexpensive vaccine against a highly contagious disease -- a vaccine that saved almost a million lives every year over the last two decades," said Henrietta Fore, executive director of UNICEF. Ukraine, the Philippines and Brazil saw the largest year-on-year increases. In Ukraine alone there were 35,120 cases -- nearly 30,000 more than in 2017. Brazil saw 10,262 cases in 2018 after having none at all the year before, while the Philippines reported 15,599 cases last year compared to 2,407 in 2017. Taken together, the ten nations accounting for 75 percent of the increase from 2017 to 2018 account for only a tenth of the global population. 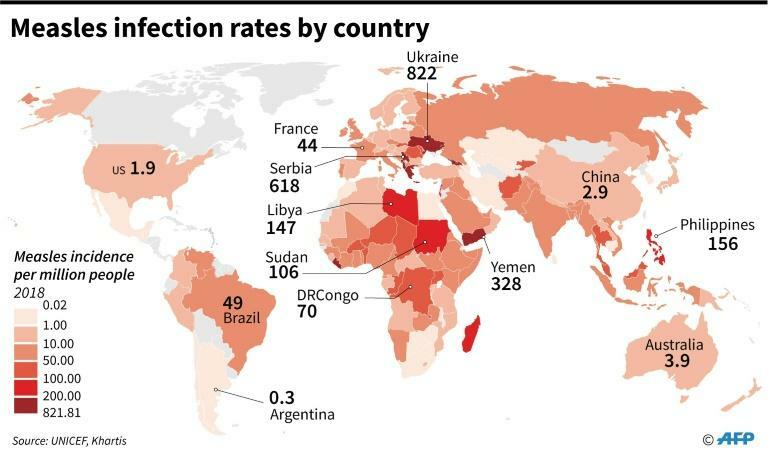 The countries with the highest rate of measles last year were Ukraine (822 cases per million people), Serbia (618), Albania (481), Liberia (412), Georgia (398), Yemen 328), Montenegro (323) and Greece (227). While most of the countries that experienced large spikes in cases are beset by unrest or conflict, France saw its caseload jump by 2,269. In the United States, there was a 559 percent year-on-year increase in cases from 120 to 791. In war-torn Yemen, where health services in many regions have collapsed, UNICEF and the World Health Organization joined with local authorities last month in a campaign to vaccinate some 13 children aged six months to 15 for measles and rubella. UN officials estimated that 92 percent of the targeted children were jabbed during the one-week push, which ended on February 14. Yemen also figured on UNICEF's "top 10" list of countries showing the largest increases last year in measles cases with a 316 percent hike, from 2,101 cases in 2017 to 8,742 cases in 2018. Other countries with huge jumps last year compared to 2017 are Venezuela (4,916 more cases, up 676 percent), Serbia (4,355 more cases, up 620 percent), Madagascar (4,307 more cases, up 5,127 percent), Sudan (3,496 more cases, up 526 percent)and Thailand (2,758 more cases, up 136 percent). 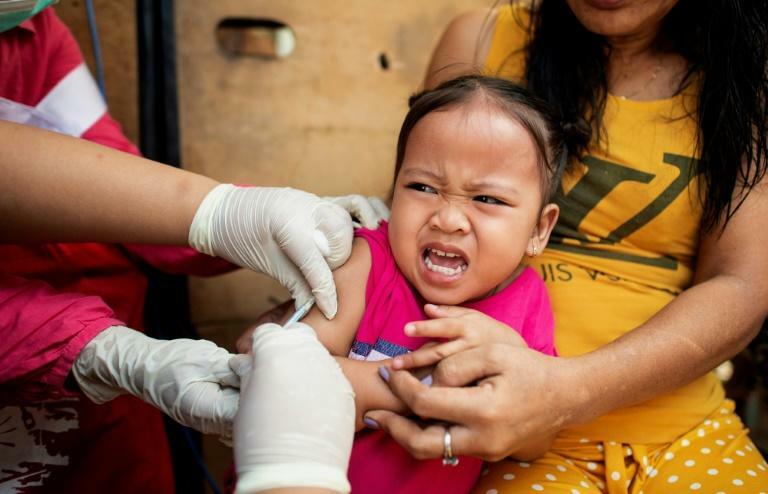 A few countries saw declines in the number of confirmed cases of measles. In Romania, reported cases dropped 89 percent from 8,673 to 943, and in Indonesia the number declined by 65 percent from 11,389 to 3,995. Nigeria, Pakistan, Italy and China also saw drops of 35 to 55 percent.